Seven projects in five states will receive funding to develop or expand water markets within their water delivery areas. Water marketing provides communities a solution to move water between willing sellers and buyers within their local delivery areas. 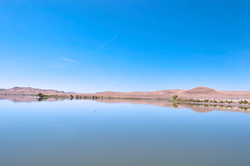 Bureau of Reclamation Commissioner Brenda Burman announced that Reclamation has awarded $1.3 million to seven projects to establish or expand water markets or water marketing activities. These seven projects are located in California, Colorado, Nevada, Oklahoma, and Washington. "Water marketing provides communities a solution to move water between willing sellers and buyers within their local delivery areas," Commissioner Burman said. "A water market is just one of the several tools water managers need to manage water within their communities." Water marketing strategy grants are used to conduct planning activities in developing a water marketing strategy. Water marketing refers to water rights transactions and includes the lease, sale or exchange of water rights undertaken in accordance with state and federal laws between willing buyers and sellers. Learn more at: https://www.usbr.gov/watersmart/watermarketing/index.html. Through WaterSMART, Reclamation works cooperatively with States, Tribes, and local entities as they plan for and implement actions to increase water supply through investments to modernize existing infrastructure and attention to local water conflicts. Visit https://www.usbr.gov/watersmart for additional information about the program.